Louie Lambe has pirated in just about every possible form and genre; sword fighting in the History Channel's True Caribbean Pirates; contributing articles to No Quarter Given magazine: sailing tall- ships to the far ends of the earth. As a performer on the Revenge From The Sea cruise, he's endured floggings, stabbings, "rosaries of pain", and even eyeball. 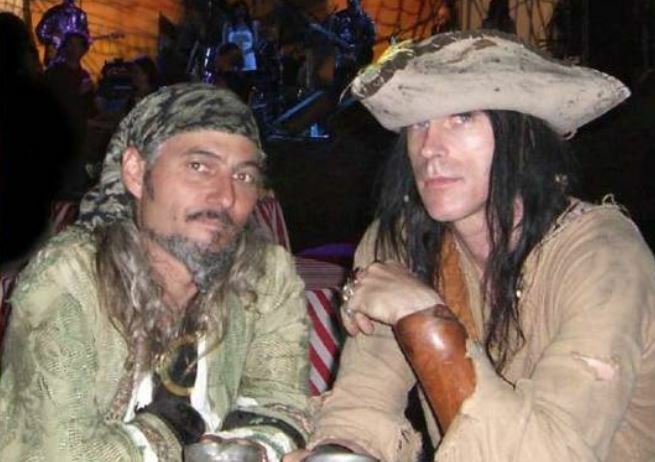 In the Pirates of the Carribean movies he was sailing double for both Orlando Bloom (in the first film) and Johnny Depp (in the third). Actor, sailor, sword fighter and Jack Tar of all traddes, Louie is indeed a pirate to be reckoned with. He recently took a few minutes from his busy life to speak with Mutiny Magazine. Mutiny Magazine: What was it that got you involved in the pirate community ? Louie Lambe: I got started by going to events with friends. I saw how much fun the pirates were having and that chicks seemed to dig the bad boys so I said: "How can I do that?" Little by little, I got more involved. MM: Little is know of you because you're not online. I personally like the idea that someone needs to actually call your phone to get a hold of you. Why do you not have an online profile of some kind ? LL : I do have a website but it's just for acting work. I'm a little wary with all the web stalkers and drama that seems to get started online. I just try to avoid it all, plus I hate typing. MM: Even without an online presence I realized I had seen you before I'd even met you. But I didn't know where until one day I turned on the TV and there you were. LL: The TV work is very hit and miss, mostly through No Quarter Given. we got a reputation for doing a very professional job and not asking for too much money. But there's a lof of blind luck involved. Just being in the right place at the right time. MM: As an actor, what are your favorite roles to play? LL: Sword fighting combines all the skills of a performer. There are times whenit seems hard and times when it's completely natural, like walking. The main thing is to be in the moment and be honest. part of a smaller, more personal group.